Two Digital Music Player announcements in the last week point the way to features that will have long-term impact on the way people use these portable devices. Competing with Apple's iPod on the price/convenience/design equation has been a hard row to hoe. So an alternative is to compete on significant new benefits. The kind of benefits we can expect, based on the announcements, are: more social interaction, so you can communicate and share through the device; and a more dynamic collection of tracks, personalised to your preferences. People are used to two ways of listening: the radio offers near-zero control of what you hear (though you can always change channels), the CD player offers near-total control of what you hear. Personalised radio services like Pandora, Last.fm and Yahoo's LAUNCHcast are starting to get people used to a more hybrid experience — radio you can tune to your tastes. But these have always been shackled to your computer. Photo by davidjennings, cc licensed. I spent Tuesday and Wednesday last week at a 'summer school' on recommender systems, hosted by MyStrands in Bilbao (thanks, sincerely, to them for their hospitality, and less sincerely to EasyJet and British Airports Authority, whom I blame for a less enjoyable twelve-hour stay at Stansted Airport on Monday). There's a session-by-session blog of the whole event, with downloadable presentations from many of the speakers. Sadly I don't have time to record detailed observations on what I learnt there, though several points will all feed into what I write from now on. Certainly I know a lot more about the different varieties of systems for recommending music, films, digital cameras, Mercedes (statistically. people who bought leather gloves also bought Mercedes, apparently), as well as their strengths and weaknesses. I recommend Juntae Kim's presentation as an introduction. Most interesting to me was John Riedl's talk and subsequent discussion about the impact of recommender systems on community. I'm wary of a view of recommender systems that believes they are complete solution. Recommender systems are a form of push technology, and as such they could be seen as a systems designed for sheep — when I argue that we need systems designed for foxes, squirrels and seagulls (in other words, active foragers not herd-followers). Any idea that recommender systems will do all our filtering for us, and all we need is a highly-personalised relationship with some well-crunched data needs to be nipped in the bud. 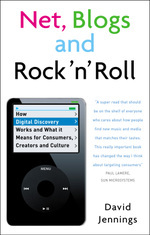 The Digital Music Survey by Entertainment Media Research (and, apparently, Olswang) covers many interesting areas, from MP3 players to DRM to illegal downloading. There's a 106-page PDF with a rich set of figures available for free download from Entertainment Media Research's site. I'm going to focus here on a couple of the findings concerning discovery and sharing of music. 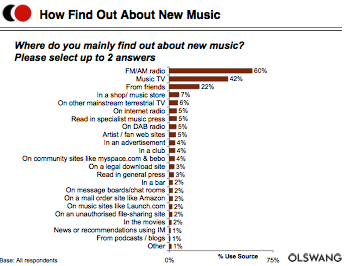 The chart on the right shows the different ways in which people find out about new music. I've said it before, and I'll say it again: don't write off radio (outside the US, at least). The proportion of people discovering music via community sites like MySpace and Bebo is only 1 in 25. However, this conceals some differences between age groups. 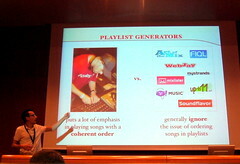 Where are the innovative classical music discovery services? Perhaps you don't expect the classical music field to be at the bleeding edge of new techniques for recommending new music, or what they might call 'audience development' (though see my Classic.TV case study). So I was interested to see the announcement that Classic FM's website has been enhanced to include a Learning Area. You couldn't get away with calling anything on a pop/rock site a 'learning area'. Word-of-mouth is a powerful and effective way of promoting products. You can't control it, but can you encourage it and harness its energy? In the music area, a couple of initiatives have started, with mixed receptions. Weedshare has been running a scheme for several years now, which encourages you to share digital music files with your friends by email, instant messenger or your website. They can listen to each file three times for free, but then have to pay to enable unlimited plays. If they do pay, you get a commission. It seems like a transparent model, and fairly simple in broad outline (though I think it gets complex in the details). The Digital Music News blog and associated comments give a mixture of opinions. It's fair to say that Weedshare hasn't exactly taken off and hit the mainstream, but that's possibly because (a) it has no major label music, (b) it uses Windows Media files (incompatible with iPods) with DRM, and (c) on the receiving end, illegal peer-to-peer sharing is more attractive, because there's no payment. 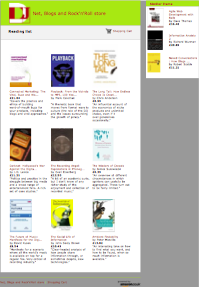 If you've been tracking this site for a while, you may notice that the chapter-based categories for each entry have disappeared. That's because the structure of the book has changed… Well, I did include disclaimers in the original announcement to say that it might change, and how prescient that turned out to be! When the structure is definitely tied down and the book is nearing publication, I will go over all the entries here and assign them to categories for each book chapter. But it seems daft to do that now, in case things change again.